Hurricane Irene cut power to more than a million people in Puerto Rico, downing trees and flooding streets on Monday, and forecasters warned it could be a major storm as it threatens Florida and South Carolina by the end of the week. There were no reports of deaths of major injuries in Puerto Rico, but Gov. Luis Fortuno declared a state of emergency and urged people to stay indoors to avoid downed power lines, flooded streets and other hazards. "This isn't the time to go out to find out what happened ... This is the time stay in your homes," Fortuno said at a news conference. The first hurricane of the Atlantic storm season posed an immediate threat to the northeastern coast of the Dominican Republic, though the center of the hurricane was expected to miss neighboring Haiti, which shares the island of Hispaniola. Nearly 600,000 Haitians are still homeless due to the January 2010 earthquake and that country could still see heavy rain and tropical-storm-force winds, said Dennis Feltgen, a spokesman for the U.S. National Hurricane Center in Miami. "We don't expect to this to get ripped up over the mountains of Hispaniola," Feltgen said. "We expect it to remain a hurricane." The U.S. National Hurricane Center projected that Irene could grow into a Category 3 hurricane with winds of 115 mph over the Bahamas on Thursday. And it may carry that force northwest along Florida's Atlantic coast and toward a possible strike on South Carolina, though the forecasters warned that by the weekend, the storm's path could vary significantly from the current projection. A hurricane warning was issued Monday for the Turks and Caicos Islands and the southeastern Bahamas. Authorities in Palm Beach County directed staffers to stop routine operations Monday and switch to storm preparations, including checks on generators and communications equipment. "Hurricane preparations are pretty much the order of the day," said Mike Geier, radiological emergency preparedness planner. "We go through a pretty extensive checklist. It's probably three pages long." Officials in Charleston, South Carolina, warned residents to monitor Irene closely. It has been six years since a hurricane hit the South Carolina coast, said Joe Farmer of the state Emergency Management Division. Hurricane Irene centered about 50 miles north-northeast of Punta Cana, Dominican Republic late Monday morning and it was moving toward the west-northwest at 12 mph. It had maximum sustained winds of about 80 mph with higher gusts, the Hurricane Center reported. In Puerto Rico, crews were out clearing streets and assessing the damage but the governor and other officials gave no indication when power would be restored. Schools, most government offices and many businesses remained closed. Flights were expected to resume at the international airport in San Juan by mid-morning. Dozens of people in San Juan sought emergency shelter ahead of Irene and authorities evacuated 150 tourists from the outlying islands of Culebra and Vieques as the storm approached. Irene had previously churned through St. Croix in the U.S. Virgin Islands, where more than half of the inhabitants are still without power, said Christine Lett, emergency management spokeswoman. In the Dominican Republic, officials assured residents they had food available for 1.5 million people if needed. Also, soldiers and emergency management crews evacuated dozens of residents from high-risk areas along the southern coast. Many stores in the capital of Santo Domingo closed Sunday even as people bought last-minute items like flashlights. The international airport and others remained open late Monday morning, although dozens of flights had been canceled. 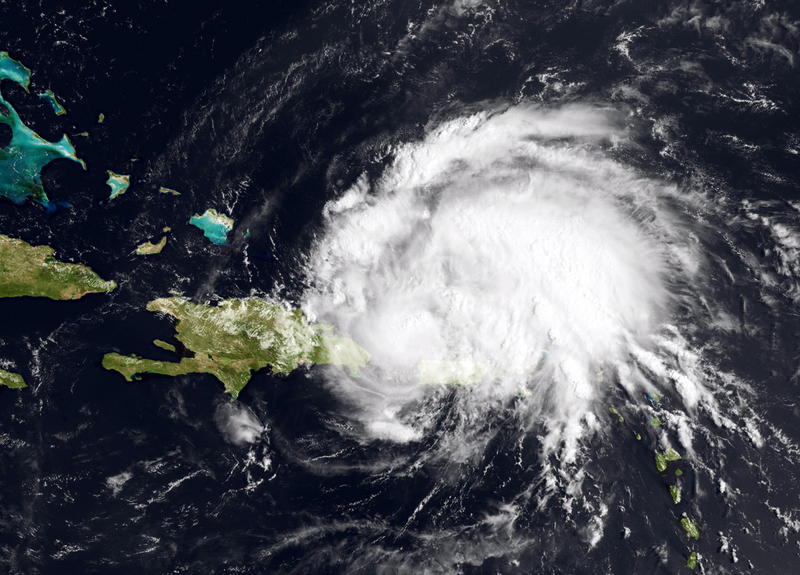 Irene is expected to lash the northeastern region of the Dominican Republic for up to 15 hours, local meteorologist Miguel Campusano said. In the popular tourist city of Punta Cana, emergency crews prepared for the storm but have not taken any special measures, said Candy Gomez, spokeswoman for the Punta Cana resort. The Hurricane Center said the main impediment to the storm's progress over the next couple of days will be interaction with land. If Irene passes over Hispaniola's mountains or over parts of eastern Cuba, the storm could weaken more than currently expected. "However, if the system ends up moving to the north of both of those land masses it could strengthen more than expected," wrote forecaster Richard Pasch.